Planes, boats and bicycles--sv & rv Odin: We're here! The cat settled in moderately well. She seemed to know we were home (after spending a day under my brother-in-law's bed). She groomed herself and went to sleep. After a couple days, she moved out to the settee to take her naps. I even found her out there a few times in the middle of the night, after going to bed with us. 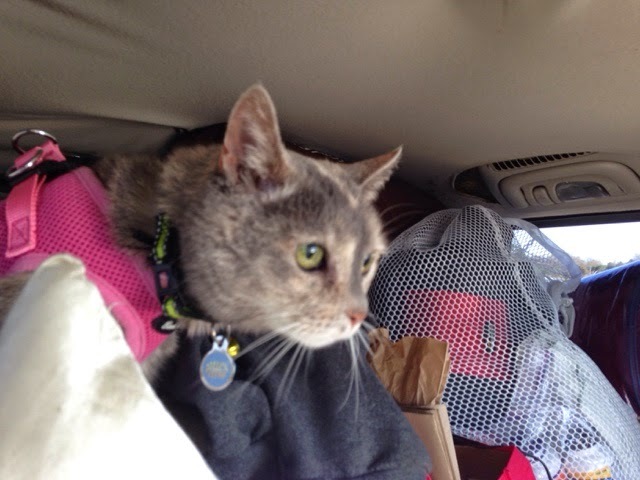 She ate, drank and used the litter pan, even in the car. What a trooper. One of the funniest things was when she saw Daddy through a "overhead hatch." That entertained her for at least 30 minutes. Errands begin in earnest. West Marine. Grocery store. Liquor store (because that's a separate stop here, but it's next to West Marine! Coincidence?). Hardware store. Target. Lunch. Repeat. Remember, we're sharing a car, for now. Day 1 (Wed) is a half day. We arrive around 3. The marina is hopping. They are dropping power boats in the water faster than you can count. Captain dewinterizes the boat and fills the water tanks so that we have running water and a working head (bathroom). Then he fixes a leak I find at the base of the mast that is leaking into our berth (a cable running down mast has lost its seal--shoved in a wine cork. Thanks for the cork bottle, Pat). I start dragging our stuff to the boat (which is at the very end of the dock, by the way). It looked like the minivan exploded on our settee. "Do we have a change jar?" Yep. "Where is it?" In a box. We fall asleep before our heads hit the pillow. 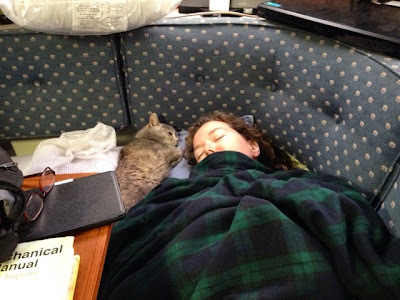 Flannel sheets, a sleeping-bag-comforter and a space heater keeps us cozy. 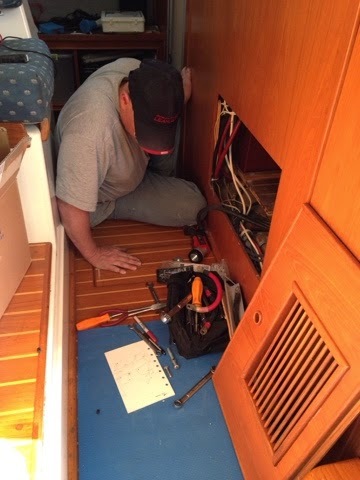 Day 2 (Thurs): The Captain installs the solar controller, replaces the original (starboard) battery bank, changes both engine fuel filters, and oil on the port engine. 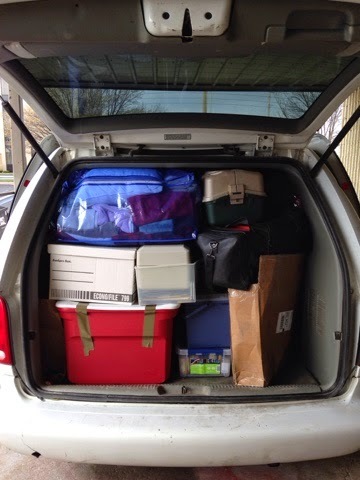 I drag more stuff to the boat, run errands, grab lunch, start wiping out cabinets and begin unloading. The power boat that is stern-to-stern with us shows up for an engine run and fills our cockpit with black smoke. Good times. It's a full moon with a high tide so we are constantly awoken by the lines creaking and the bumpers squeaking against the dock (note to self: dock port side so you're not sleeping on the side of the squeaking bumpers). Day 3 (Fri): It's an overcast and windy day. Captain installs the new second bank of batteries so we now can hold 700 amp/hours. 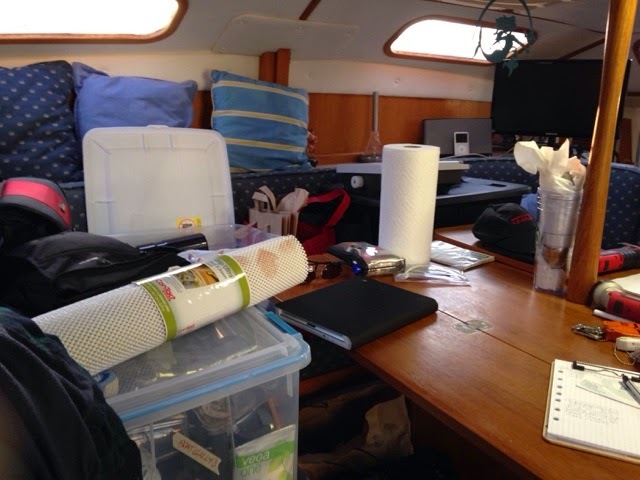 He also changes the last of the running rigging which is the reefing line and "one of the most difficult projects so far." He begins removing the original boat name (dock side). 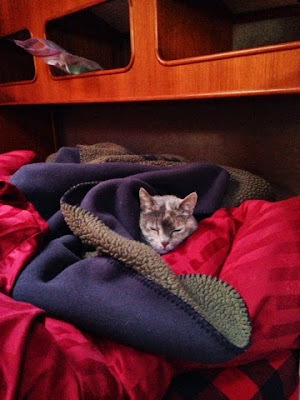 The First Mate goes down with food poisoning. I've previously been bashful about using the head, preferring to walk up to the office bathroom. However we have now been formally introduced and we are good friends. 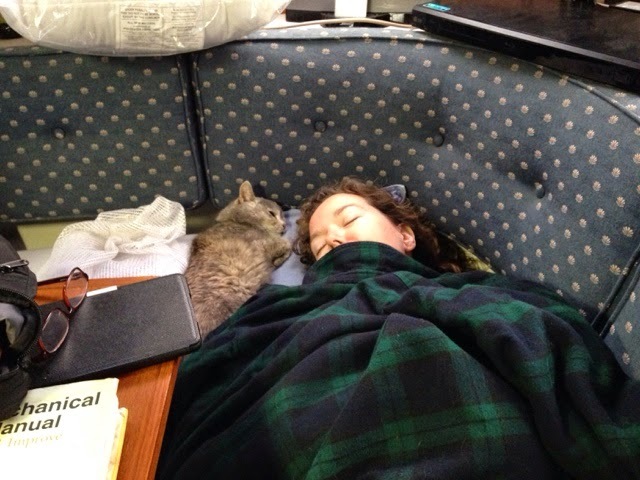 The cat & I sleep all day. It's a windy night and the boat is making lots of loud noises. A slapping halyard brings the Captain bolt upright. It turns out to be another boat directly across from us, and too long a walk to secure.